Juniper heart wood rings with black wood liners. These rings feature a natural knot. 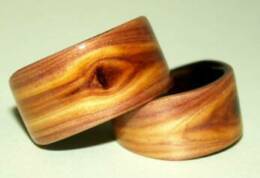 These are tapered rings made of juniper heart wood with blackwood liners. The woman's ring is a size 6, it is 10mm tapered to 5mm. His ring is a size 10. It is 12 mm tapered to 5 mm.